New Guinea contains many interesting species of tropical insects including arboreal species of termites. Rather than building nests on the ground, these termites build nests on the trunks and limbs of trees. 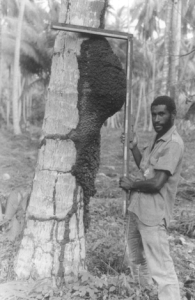 These termites can be found infesting coconut plantations.